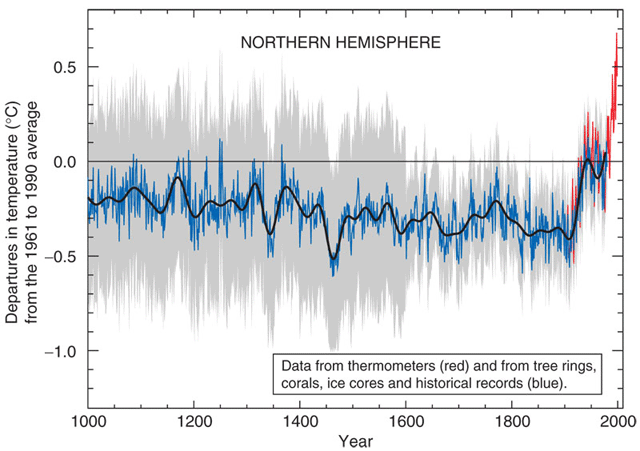 IPCC throws Mann's Hockey Stick under the bus? | Watts Up With That? 7) The 30 years from 1983-2012 was very likely the warmest 30-year period of the last 800 years. That is an interesting statement, not so much for what it says, but for what it doesn’t say. A caveat; that’s likely the reporter’s summary, not the exact text from the IPCC “leaked draft”. IPCC verbiage tends to be a bit more bloated. But, I think it is a fair summary. So, they’ve gone from saying warmest in the last 1300 years to the last 800 years. Where does that figure in on Mann’s hockey stick graph from AR3 in 2001? Figure 1. The hockey stick graph as it appeared in the IPCC Third Assessment Report WG1 (2001) summary, Figure 2.20, Northern Hemisphere temperature reconstruction. So basically what they are saying is that at the year 1200 (2000AD minus 800 years), temperatures were warmer (or at least equal to) temperatures today. Compared and overlaid with Mann’s work, which was highly criticized for turning all the proxy data from 1000AD to 1900AD into a nearly straight flat shaft with an upturned blade at the end, that 1200AD bump looks like the elephant in the proxy samples room. Figure 3: IPCC 1990, Mann 1999 and Moberg 2005 data overlaid. (red) IPCC hand-digitised from IPCC 1990 figure 7.1c (note: it has been assumed that the tickmarks on the y axis are in units of °C and that the middle of the three represents zero). Somewhere, Hubert Lamb must be pleased that his work from IPCC’s FAR in 1990 showing a warmer Medieval Warm Period than the present is getting attention again. Steve McIntyre must also be smiling at this. The question now is: will this inconvenient bump be flattened and sanitized in the final version of IPCC AR5? I’m the author of the blog post on the IPCC report. My post just featured a handful of findings… it’s not at all comprehensive…just a teaser. This is great, The IPCC graph from 1990 is what was presented as the accepted norm for the 30+ years prior when I was stumbling across paleo-climate when reading up on paleo-anthropology. Mann’s version was and is pure fabrication, created for political purposes, by a tool. Since the IPCC spearheads this war of propaganda for the warmist side, I would not get my hopes up that it will come clean any time soon in the near future. The rewriting of climate history is a necessary component for the IPCC. Oh, and regarding that inconvenient hump on the left that is so incongruous with Mann’s plot, it was proceeded by an even larger one. Reports of the resurrection of the MWP have been exaggerated. And as Tony Brown at Climate reason has shown and recently posted here, a 50 year smoothing and a 30 year smoothing eliminate the decadal variability which according to CET records suggests there were multiple warmer decades more recently than the MWP. Still a bit of possible climb down given all the post AR4 hockey stick controversy. Here is Lamb in 1965 on the Medieval Warm Period and the Arctic. I believe this is one of those “the science has moved on, why haven’t you?” moments. They don’t mention the bit about obviously bad science being ignored for a long time before being quietly swept under a rug. Even Michael Mann says it was a bit toasty in the Northern Hemisphere during the Medieval Warm Period. Now, where are those German olive groves? OK, but we are trying to minimise the damage to science from climastrology and, therefore, we need to make the climastrologists walk over the rug so they trip up over the bump caused by what is under it. Clever move to keep dragging the old hockey stick out of the cupboard, Tony. It keeps the image clear in our minds – after all, it is around 15 years old. Before you work yourself up into too much of a lather, though, isn’t it best to wait for publication? The 30-year period 1983-2012 was the warmest of the last 750 years, except for the period 1923-52. A number of 30-year periods between 923 and 1252 were warmer, as too during 77 BC to AD 252, 1077 to 748 BC and 6077 to 3252 BC. Amazing caveat, it says everything about climate science you ever wanted to know. Those who pay for the research will insist on having the results they were promised. This 800 year statement on its own kill’s off the AGW hypothesis as it seems the modern warm period lies within the probably natural temperature range for this interglacial. You cannot say the modern warm period is both natural and anthropogenic. So where in the AR5 report is the apology for Mann’s erroneous work? I guess that is to be discovered. I mean they are now saying they got it wrong are they not? I guess the word ‘likely’ means 97% consensus. This raises the question as to how the IPCC gravy train is to be fuelled in future or more likely what new jobs will be available to people who have helped rob the people blind for years and years. Something in the UN, or maybe banking? re your post at August 21, 2013 at 9:02 am. Please go to the WUWT thread on Trenberth’s recent egregious comment. There have been no trolls on that thread and it would benefit from having troll comments to laugh at. This is a link to it. Non-sequitur I’m afraid. The statement only says that ‘ The 30 years from 1983-2012 was very likely the warmest 30-year period of the last 800 years.’ It says nothing about what went before. Then there was that warm period coinciding with the Roman Empire, and a warm period around 1500 BC which lasted for quite a while. The whole point is, the greenhouse gas paradigm precluded the incommensurate theories and data from the start. The relations between solar activity, volcanic activity, and temperatures affecting civilization and crops are still being ignored. Powerful infrastructure, agricultural and mass manufacturing will carry people through a period of low solar activity and further temp drops from large volcanic eruptions. So the last half of the 20th century was warmer than any other period since the start of the Little Ice Age. Isn’t that about what we’ve said all along? It was that whole “get rid of the MWP” BS that was the issue. This seems to me they are in a roundabout sort of way without saying it that the MWP existed and was as hot or hotter than we are today. Which is exactly what we’ve said for 10+ years. so basically the hockey stick graph’s gray confidence region needs to be a LOT bigger. Yeah but, anyone with half a brain knows the Minoan, the Roman, the MWP all were warmer – in all cases much warmer than the present day but in having said that……………………. what does it matter? Subject off topic: Can anyone following the literature? May 1940. Washington, D.C. 1942. Vol. VII, p. 373.
is too strong, and does not follow from the choice of words. It is fair to say that the IPCC wording is a rowback, and that is worth mentioning, but going too far just opens one up to a counter-claim. I think it is fair to say they’ve made progress, and while previously they felt they could rule out the existence of a MWP warmer than today, they not longer feel that they can rule it out. This seems to me they are in a roundabout sort of way without saying it that the MWP existed and was as hot or hotter than we are today. They aren’t saying the MWP was warmer, they are saying it might have been, with a high enough probability that it cannot be ruled out. CFR / UN / CoR decided in 1971 to use environmental concerns for their globalist agenda. From that moment on government science funding in the West depended on the perpetuation of any alarmist scenario the scientists could come up with. there is no sign of relenting. The NGO’s are still funded by the EU to keep up the pressure from above – pressure from below strategy. I see the 800 year claim by the IPCC as a minor tactical retreat; the media will continue to show us angry Greenpeace thugs etc. Nobody in the media will talk about the tacit admission of the existence of the MWP. It can easily be ignored in the political arena. I take it that you view the hockey stick as a fraud that is an embarrassment to your movement and should be covered over and hid. Jason, next time you talk to one of your IPCC sources, why not “dig a little deeper” and ask them what physical theory and what physics-based equation they use to convert a tree metric into a temperature degree. Here’s a prediction: they won’t have one. Prediction: complicated non-explicatory writhing that translates as tendentious re-scaling. So, deep digging leads you to, paleo-temperature reconstructions: no physics, no science, all opportunistic statistics. The real story is found right down there at the bottom — when you discover that paleo-temperature reconstructions are pseudo-science. And if the IPCC is peddling pseudo-science, then what? Not necessarily. They could just as easily be able to say “We don’t know the global temperature before then. And the the hockey stick is somewhere under the bus. Government review? What is the government doing reviewing scientific reports? To bad nobody ever mentions the RATE of warming during specific periods over the last 1300 years that on many occasions exceeded the more recent rate. For example late CET 17th Century to early 18th Century (no emissions to speak of) the temp rose by 2 deg C over about 40 years. Nobody in their right mind is going to place more trust in the proxy data of “Mann, Briffa, Jones, etc.” than in the careful – and taxed – tabulations in the Doomesday Book. The Medieval Warm Period is documented from places distributed around the globe, and it is not adequate to assert that it was “not global” because it did not happen everywhere at exactly the same time: the claimed present day global warming is not happening everywhere at the exactly the same time. “Clever move to keep dragging the old hockey stick out of the cupboard, Tony. It keeps the image clear in our minds – after all, it is around 15 years old. No, because we just learned that Mann is fighting for his reputation within the IPCC at this time. Because Alarmists do not use the word ‘falsification’, I wonder what new word they will invent if Mann loses this fight? Hey all you guys on the other thread! Come over here! I think they found the missing hotspot! Brilliant post, as usual. Yes, they have done no work in physics to support their “dendro” claims. They have conducted not one experiment on proxies. Comparing one set of proxies to another does not count as an experiment. The Mann (and others) paleo climate proxies do not pick up the real world annual and decadal temperature which show considerable variability. This is because the paleos use ‘smoothed’ 30 and 50 year calculations that don’t find this information-in other words the paleos are very coarse sieves and the finer grain annual and decadal records fall right through the models without being seen. The past climate being ‘smoothed’ therefore looks much more stable than it actually was when looking at the actual temperatures we all actually experience. BBould says “Which comes first — the science of climate, or the art of persuasion? Not meant to cast aspersions on the dedicated and ethical climatologists, physicists, paleontologists, etc. who work in the field of climate study, but just how scientific is “climate science?” Maybe about the same as the “science” of psycholgy, where theories can’t be fully tested because the one quadrillion neural connections in the human brain can’t be controlled for comparative experimentation, Hypotheses predicting quantifiable global climate behavior are for the most part unprovable, even over hundreds or thousands of years into past and the future, as experimentation has been and will be fettered by an uncontrollable set of millions of climatic inputs and switches, as in the “butterfly effect.” Too many people assume that the statistical probability attributed to climate computer models is actionable certainty because of these 97% and 95% figures constantly quoted. 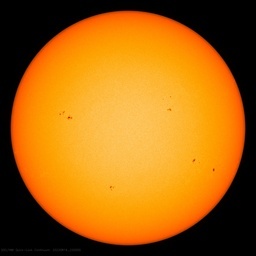 Can we really predict solar activities and anomalies? Have we ever accurately predicted climate changes? I don’t know. It seems that Climate Science is still in the hypothesis and prediction phases, with a lot of theories, a large accumulation of data, and little scientific proof of anything. This is exactly why the AGW crisis “movement” is so unacceptable and why I am addicted to WUWT. Very well done, and the links within it are informative. Mann’s hokey stick chart never was any good. It is not science; Mann will not disclose how he constructed the chart [although McIntyre & McKitrick figured it out], it is contrary to all previously published, peer reviewed literature, and the data was cherry-picked to fabricate what is a very alarming [but false] chart. It is past time when the IPCC should have thrown Mann under the bus. He is no honest scientist. which links to an email from the egregious Mann in response to having been provided by an email from me to Chuck Keller long, long ago. I was not aware of Mann’s having seen it or having commented on it until I saw the link in your post today. And Mann’s comments made me laugh out loud! This is intentional misrepresentation. For his sake, I hope does not go public w/ such comments! Deceipt!? Mann accuses me of “deceipt” for pointing out what he had done!? Mike’s Nature trick (aka Hide The Decline) DID include “splicing of two different datasets” but one data set was covered by the other instead of being truncated. I have had the honour to work with Fred Singer for many years on several things. But “hired”? How wish that were true. My contributions have almost entirely been at my own cost in time and in money. And I could not have been – as I was – the first to point out what Mann, Bradley & Hughes (MBH) had done if I had not read their ridiculous paper. And I love – I really love – the bluster about “for [my] sake”. I first made a public statement (in a widely circulated email) reporting my observation (n.b. NOT a “misrepresentation”) within a week of the publication of the MBH paper in 1998. I have often repeated the observation since then including on WUWT. But the Mann has never contacted me. Again, thankyou for the link and the laughs it gave me. I have copied the link. IPCC confidence is revealing itself, once again, to be negatively correlated, with high certainty, with any form of validated data. Does anyone want to point out we were measuring temps with satellites only since 1978. How do we know if previous warm periods, such as the 30s-50s, would not have shown up warmer. The next 15-25 are going to show alot, because the pdo and then the amo will be cool again and we will be able to measure it. BTW this also takes away from the fact that even with satellites, the warming as stopped, which would fit in nicely with this being a decadol response to coming out of colder, ocean driven period. We have our test case in front of us now. Its just frustrating to see people just assume that measurements of temps in pre satellite era can simply be assumed to be as valid as now. Case in point, Noaas playing with arctic temps, which there is no way they could have known the way they do now, before the satellite era. Nice to see ol MM tossed under the bus. Guess we’ll take what we can get. Truthfully, I’d have been shocked to see this august body who’s very existence depends on the very thing they’re entrusted to tell us is there or not, backed off in the slightest. No, they don’t say that. They say that they’re not sufficiently certain that they were not warmer than today. That’s a good sign but let’s not be too enthusiastic about it. Right on! Will Jason do as you ask? Not likely. Jason and his ilk do not care about the truth. NO! They just keep pushing the soialist/marxist political agenda. Give them a sandwich board and put them on the street. A teaser for what ? The government approved take on the science ? You gotta be kidding me, or is their hold on you that strong ? You thanked us for reading it….it only made me sick to my stomach. This is the kind of post that begs for a specific cartoon from you … Michelangelo … MichaelManngelo … chipping away the MWP and LIA and other periods to reveal the David statue hockey stick that was there all along! Mann’s HOCKEY STICK is not worth the paper it is written on. I would go so far to say that the climate from 1850-present has featured one of the most stable climate intervals over the last 20,000 years. In addition their were many many periods when not only were the temperatures warmer then at present but the temperature rise into these warmer past periods was much more rapid. The 1850-2005 interval of climate was a period when the sun emerged out of the Dalton Solar Minimum and displayed a steady 11 year sunspot rhythmic active cycles with peaks and lulls which brought the climate out of the Dalton, to what we have had since. The good news is this active period of solar activty came to an end in earnest during year 2005, and we have now entered a prolonged solar minimum , which is going to result in a temperature decline going forward, and end the AGW theory. The solar parameters necessary to accomplish this should be present for the balance of this decade and beyond. Secondary effects from solar variations can become the main driver of random earthly climate events if the degree of magnitude change and duration of time of the solar variations reach certain sustainable levels. This decade will give us a chance to see how this works out, and should bring about the downfall of the IPCC, and their useless climate models. The 800 year period goes back to the beginning of the LIA. In that respects, it appears the IPCC is hedging their bets. As Dr Wegeman and McIntyre have previously pointed out, tree-ring proxies are not reliable beyond 400 or so years. To say that the latter half of the 20th Century was as warm as the final decades of the MWP is really not saying anything new. And the confidence of such a statement is 50% at best. Yet, the 800 year meme sounds impressive to the layman. It’s all about PR. Which is what the MBH9x proxies turned out to be alll along. The problem is, many unengaged people (and thanks mostly to this invaluable site and others, that number will continue to decrease) will swallow that having the warmest 30-year period in 800 years is somehow significant. Will they look any further back? If the people who paid for this don’t like it, then it’ll be changed! LOL. The stance might change after government review? Uh, this is supposed to be science I thought? No AGW , No IPCC its that simple . Now does anyone think this turkey is about to vote for Christmas? So the IPCC’s story will be: The last decade has been the hottest ever (for the past 800 years). They’d better scratch that last point, otherwise the current temps are not unusual. Also, do not look at that Mann behind the curtain, the Mr. No Temperature Rise this decade? “MCA….These intervals did not occur as coherently across seasons and regions as the warming in the late 20th century”. Once again, they are confusing data availability with reality. Since the planet has pretty much been steadily warming for the past 15,000 years or so, surely — with some prominent exceptions — almost every most-recent-30-year-period would have been warmer than anything before. Anyone seeking to disabuse Green Gang catastrophists on matters of fact will soon discover that, as indecent Watermelon types [Delingpole] rational debate is the very last concern of raging One World statist ideologues. Is this the beginning of the end for man made global warming? Anthony, I find curious that you wrote that update quite quickly, but you haven’t amended your story in any other way. The update contradicts your starting point and your headline. Even without the update, the argument was weak: the IPCC changed its “highly likely” time period from 500 years to 800 years — rather the reverse of dropping the hockey stick, it finds reduced uncertainty compared to six years ago. By the way, the image of figure 3 and its caption are under a CCA license. Surely you should give attribution? Right now it looks like you made the plot and write the caption. 30 year periods for temperature measurement are an oddity to me!, Why not 50 year or 100 year periods? Is this because 30 year periods can be shown to display what appear to be unusual/unexplained temperature spikes? Anyway from what I have seen, we are cooler today than we were at the end of the last Ice-Age 11,500 years ago, & the last 4 Inter-Glacial periods going back 500,000 years, were warmer than today by between 3-5°C! “I feel I’ve seen plenty of evidence (of an ice-free arctic,) including pictures in geologist’s studies showing beaches formed by ice-free waves on arctic shores. I’m sure other’s will point out other evidence, but one thing that fascinates me is the phenomenon of cross-polar-flow, which gives us our cruelest and most bitter blasts of arctic air, even as far south as here in New Hampshire. During the long arctic night air gets colder due to radiating away heat into the starry sky. The longer the air sits up there the colder it gets, however usually it is nudged out as a high pressure area. If it moves south it reaches sunlight and starts to warm and moderate, however if it moves the other way, from the Siberian arctic over the pole to Canada (or vice versa) it has far longer to radiate away heat, and can get colder than cold. That is how temperatures can plunge to the extreme levels of fifty to eighty below zero. However, if the Arctic Sea is unfrozen, rather than that air getting colder it gets warmer as it crosses, (at least at the start of winter, until “baby ice” forms.) A warmer, ice-free Arctic Ocean would create a new source of maritime air. This is not to say the Greenland Vikings ever had an easy time of it, or that their final hundred years wasn’t miserable. However they were there for longer than the United States has existed, and when they first arrived they experienced an utterly different climate than we know now. It wouldn’t be a bad thing at all to have such a climate return. The fact politicians and their paid pseudoscientists are making such a spectacle of the issue of warming will someday be seen as an amazing example of greed-driven madness. Greenland is not the globe. It was warmer in Greenland. It was also warmer in central England. It was cooler in certain other parts. Average those together and you get something akin to the Mann 1999 curve (though there’s lots more recent work you could go for instead). The figure Anthony cites indicates that even in central England, current temperatures exceed the peak of the MWP. But that’s a mediocre figure: it’s got no error bars and is using long-obsolete data for the MWP. The above is an odd interpretation. If the leak is the final word on the IPCC assessment of past temperatures then a more plausible interpretation is that the IPCC considers that data aren’t sufficiently precise to determine if temperatures in the year 1200 were warmer, colder or much the same as today. Aren’t some of you are missing something here? … The 500 has become 800 meaning this is more certainly anomalous than before by going back further. The warmists will claim to be less cautious and more certain than before. The 50 has become 30, meaning that this is a spike that is sharper and therefore less explainable than previously thought. Like the blade of a hockey stick! Contrary to what you think, these words and numbers have been most carefully crafted to allow for the sloppiest possible interpretation that will be the opposite of what you think it will be.